The FG Trio started in 1998. Øyvind played with us until 2007 when he joined the rock band Kaizers Orchestra which was very successful. Jon Rune joined us in 2010. In between, we tried several bassists. Since then we have released a few recordings, toured all over the world, including Europe, North and South America, Japan, Australia and New Zealand and are continuously planning new tours and seeking untouched territories. Gjerstad and Nilssen-Love´s collaboration goes back to 1992 when Frode formed Circulasione Totale Orchestra together with a rock band plus Paal as a second drummer. Since then, they have worked together in various settings as duo, trios and quartets. CD/LP releases include a handful of 25 titles with various collaborations. Since the formation of this particular trio, there are a total of 13 CDs released, both live concerts and studio recordings. Latest release is “Bop Stop”, a live recording from September 2017 with Steve Swell, released on Clean Feed records. 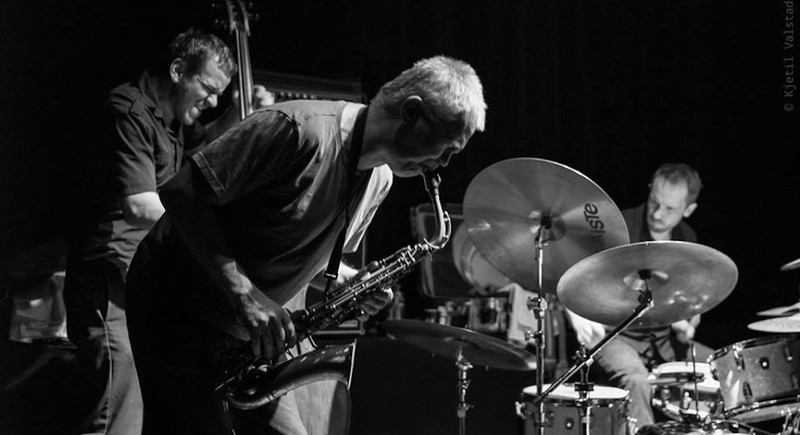 The trio’s music is free improvised and has its roots in the free-jazz tradition. The trio enjoys a high level of energy but with strong dynamics and rapid contrasts. The trio has developed a sound of it´s own and has it´s strength from many years of experience as a working group. The trio also collaborates with trombonist Steve Swell as a guest. Frode Gjerstad has for many years declared his enthusiasm towards small line-ups, and especially trio. With over 100 recordings as a leader he has established himself as a major saxophonist on the international scene. His trios have included strong drummers and bass players such as John Stevens, Hamid Drake, Rashied Bakr, Johnny Dyani, Kent Carter and William Parker. Øyvind Storesund has also played with Cloroform, a trio mixing rock and free forms,he has also played with Brøtzmann, Veryan Weston, John Butcher, Sten Sandell and of cause the rockband Kaizers Orchestra with whom he has also toured Europe several times. Jon Rune Strøm has emerged the Norwegian scene as a bassplayer with extremely high energy and stamina. Taking inspiration from William Parker, Johnny Dyani and Harry Miller, he represents a new generation of Norwegian bass players. He is also a regular member of bands like Saka, All Included, Friends and Neighbours and Paal´s large ensemble Large Unit. Paal Nilssen-Love is Norway’s most active drummers and has established himself as a powerful and a most dynamic musician through regular groups with Mats Gustafsson, Ken Vandermark, Peter Brötzmann and Terrie Ex amongst others. Jarrett Gilgore is a multi-instrumentalist, improviser, composer, and educator currently residing in Baltimore, Maryland. He primarily plays saxophone. He performs actively in the U.S.A. and internationally in a wide variety of contexts. New projects in 2017 include duos with Anthony Pirog, Anna RG, and Baltimore poet, Anna K Crooks, and a new trio with Zach Rowden and Ian McColm. He is a member of Heart of the Ghost with Luke Stewart and Ian McColm, Triage, Anthony Pirog’s Body Puzzle, Xenga. Baltimore Afrobeat Society, Chris Pumphrey Sextet, Jaimie Branch’s Bombshelter. Trombonist and composer Dan Blacksberg is one of the premiere practitioners of traditional klezmer on the trombone, and a rapidly rising voice in experimental music. With work spanning avant-garde jazz, modern classical music, improvised music, and klezmer, Blacksberg has developed a complex style to carve out new spaces for the trombone in modern experimental and Jewish music. Matt Engle has been an active member of the Philadelphia creative and improvised music scene for over 15 years. He has performed with the Dan Blacksberg Trio, Bobby Zankel small group, Sonic Liberation Front and many others.